C++ has long been a great option for cross-platform mobile development particularly in the cases where you might have an existing C++ codebase or you have certain types of performance considerations. For this article I am going to constrain the subject to mobile platforms; iOS, Android and Windows but of course this could extend to any OS with C++ support. 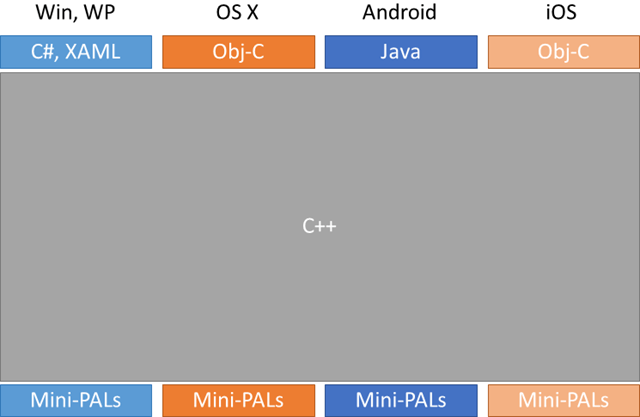 So let’s start by taking a look at the C++ support for each. In local.properties I added an entry for the NDK location. The code I used I modified the hellojni sample from he NDK. 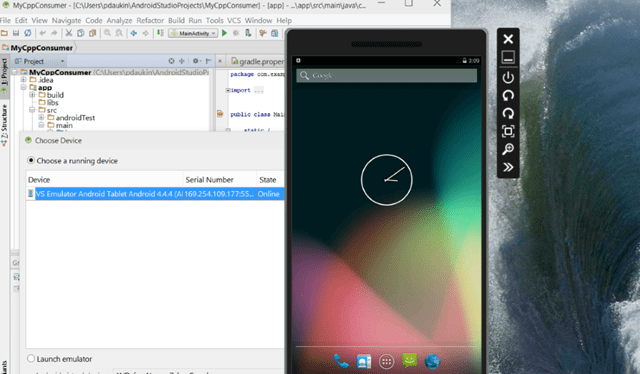 To test this I used the new Visual Studio Android emulator from Android Studio. 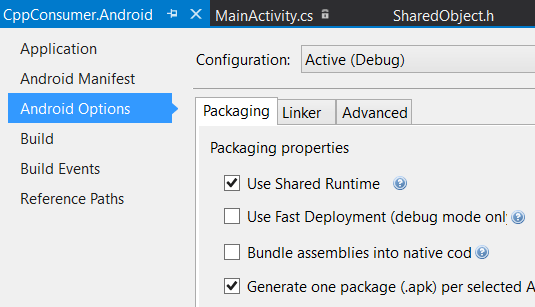 If the emulator is already running when you start debugging from Android Studio the emulator will appear as a running device debugging target. 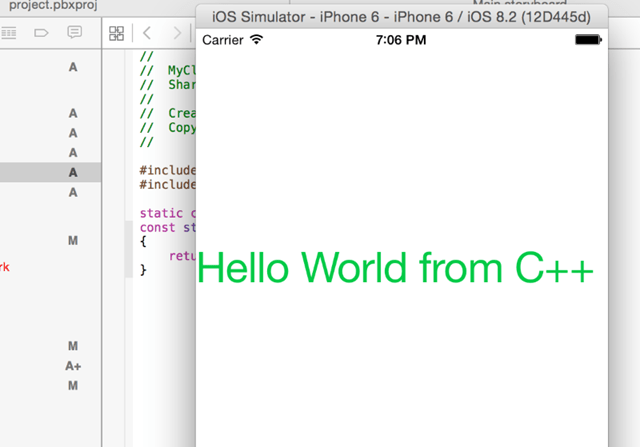 The NativeTest project shown above is an Objective-C iOS app in which I added a Label control to the ViewController. 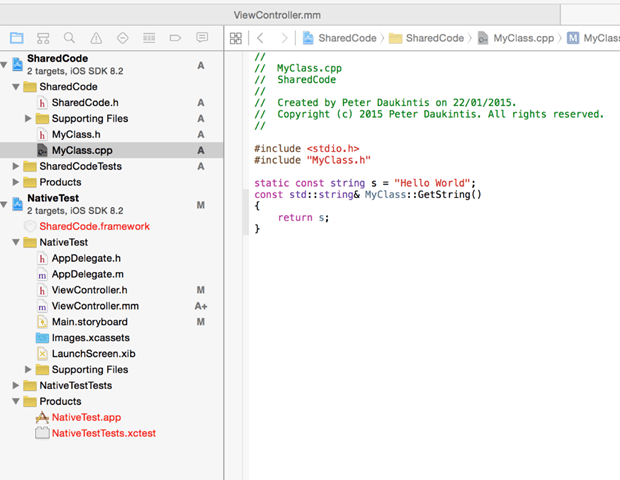 This app references the other project, which is a Framework encapsulating a dynamic shared library which contains a class called MyClass which, in turn, exposes a method which returns a string which I use to set the text of the Label in the UI. That’s about as simple as you can get but still illustrate how the C++ code can be used. I won’t bother with the Platform Abstraction layers for my simple example but it’s not easy to see why these would be created in a real project. Herb also links to some online talks which detail projects (Office and Dropbox) which have employed C++ heavily in their cross-platform strategy. The main concept here is to write as much of the code as standards-compliant C++ which can be shared by each platform. Following an MVVM (Model View ViewModel) approach fits quite nicely here as the platform-specific layer at the top would consist purely of user interface code and a binding layer and ideally the View Models would sit inside the C++ bit and be shared. I have worked on similar cross-platform code bases in the past but they have always involved retrieving the raw C++ files to each platform and building them within the environment that exists there. Bringing this within one tool would ease the burden of this workload. 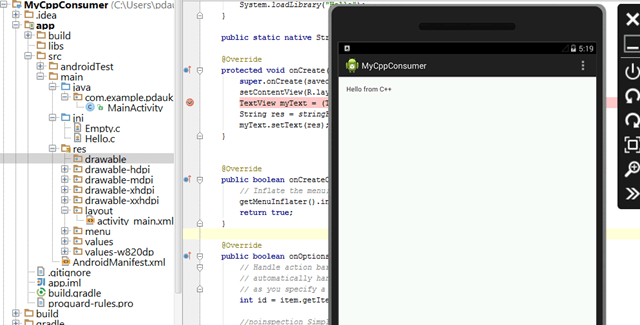 I started out by adding two apps to my solution; and Android c# app (Xamarin) and a Windows Phone C++ Xaml application. 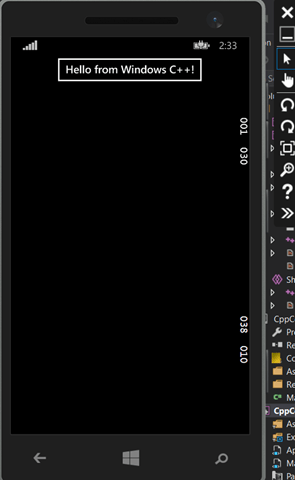 I then added one of the new templates in Visual Studio 2015, a Cross-Platform Dynamic Shared Library. 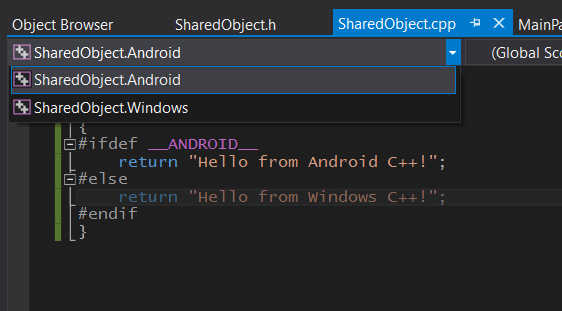 Note that within the SharedObject folder there are three projects; two for the platform specific code and the other where code can be added which can be shared. Each platform specific project is built separately and has it’s own output. 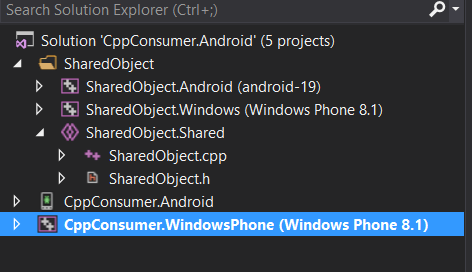 The Android library project is built using the LLVM compiler toolchain and the Windows Phone library project is built using the visual C++ toolchain. Effectively, the code in the shared project will get included into each platform specific project at compile time unless a file of that name already exists there. This provides another way, alongside using #ifdef platform defines of overriding shared code. Another nice IDE feature is that in the code editor you can access a drop-down which allows you to toggle the current build context, i.e. android or windows, in this case. The result of toggling is that code irrelevant to the ‘current’ context is greyed out and error/warning squiggles are coloured appropriately to allow you to understand in which contexts they exist. So now we have all of the required projects how do we reference the shared libraries from the app projects? 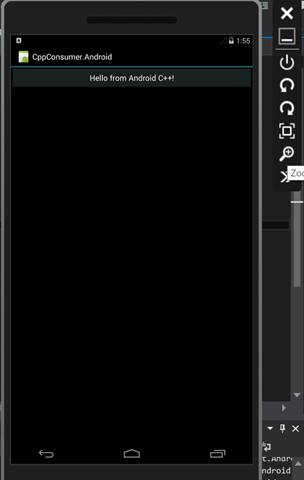 works as expected in the new Visual Studio Android Emulator. The output here is a dynamic link library with ‘.dll’ extension and similar to the Android project I added a project reference to this from the Windows C++ XAML app. Examining the output dll file shows that by default no functions are exported (I used dumpbin.exe /exports – another alternative is to use dependency walker). The LLVM tool chain used in an iOS build is ported to Windows and used to cross-compile binaries as required for an iOS shared library (.dylib). I believe the UI side of things is closed source so a Mac would still be required but the dylib could be built on Windows and copied over. The build happens on a Mac and Visual Studio communicated back and forth to orchestrate the build. Either way there is a great advantage in having an IDE that understands this scenario and can provide tooling to make the job easier. I would start with C# or Java which are fairly similar – make this choice dependent on your development environment and where you want your programs to run. C++ can be much more complex if you try to learn the whole thing. In your case, if you are interested in general-purpose, windows development then choose C#. Bear in mind also that .NET will be available on other platforms moving forwards and has been for a while with Mono. Saying a language is more powerful than another doesn’t make sense without context – choice of languages would mostly boil down to which is better for a certain scenario – there will always be pros and cons. I am planning to implement network protocol in C++ and this has to be on CentOS/Ubuntu. 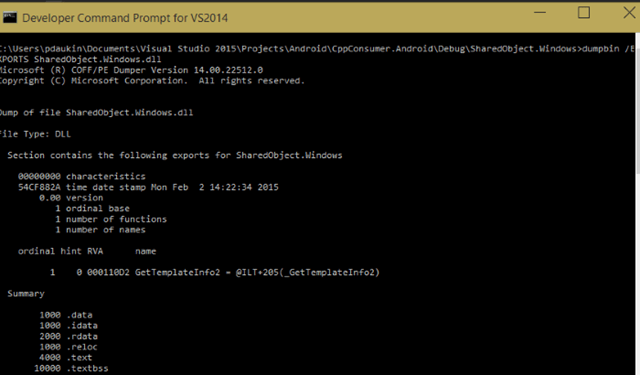 Can you please let me know whether, vS2015 will support those platform?